You’re locked in a cupboard with two women at a Rocky Horror convention. Help! Their fates lie with a Chorus of lip-licking, pelvic-thrusting Patricia Quinns in this glorious, unashamedly silly comedy. 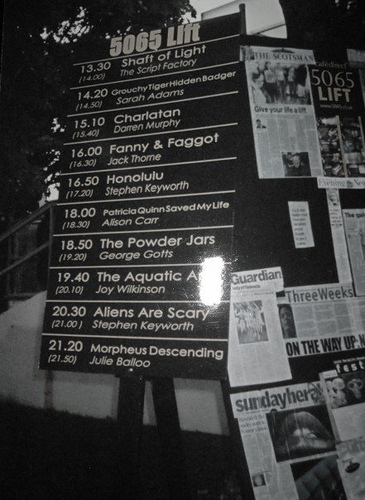 First produced by the 5065 Lift at the Edinburgh Festival Fringe 2004. The play subsequently transferred to the Hen and Chickens Theatre, London. Directed by Sam Hoyle.